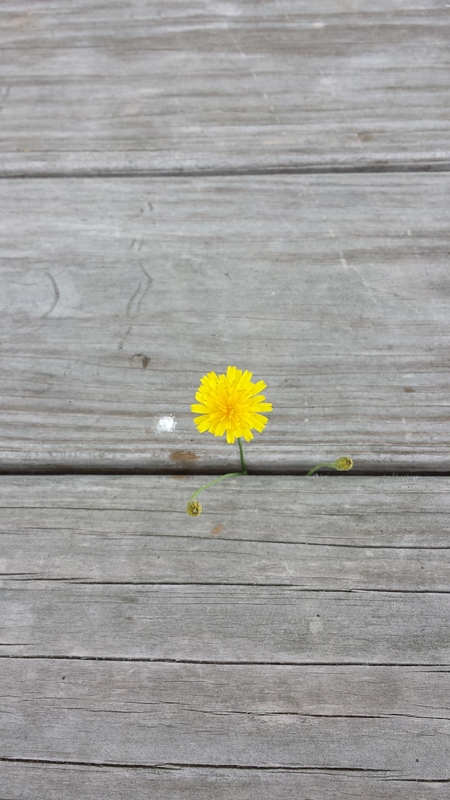 Wordless Wednesday–When is a Yellow Ray Flower Not a Dandelion? It was such a windy day when I took this photo that the only way to get a fairly decent shot was to pick the flower, sandwich it in the boards of a picnic table and get the shot. I’m sure no one minds that I picked a weed. This is a dandelion mimic, a plant called a hawkweed. Even the Spoiler asked my why I was taking a photo of a dandelion. Every summer we go through the same thing. I bend down to look at this plant and he calls it a dandelion. I say no, and he won’t believe me until I come up with some leaves to prove him wrong. The leaves are smooth and slightly rounded—-but they are definitely not dandelion leaves. Here is the plant where I picked the flower. Again, if you weren’t paying close attention, you’d easily say “Oh, dandelion.” But as you can see from that multi-flowering stem, not so. There’s already another multi-budded stem coming up on it in the lower right foreground. It blends nicely with the grass so it might be a little hard to see. Mind you, hawkweed is probably a bigger a problem than dandelions, as this post from Washington state would have you believe. They are a minor problem here–probably our cold winters. As is true with most invasives, invasives can run rampant in some climates and only be mild problems in others. I’ll be darned… I would have lost money betting on that being a dandelion! 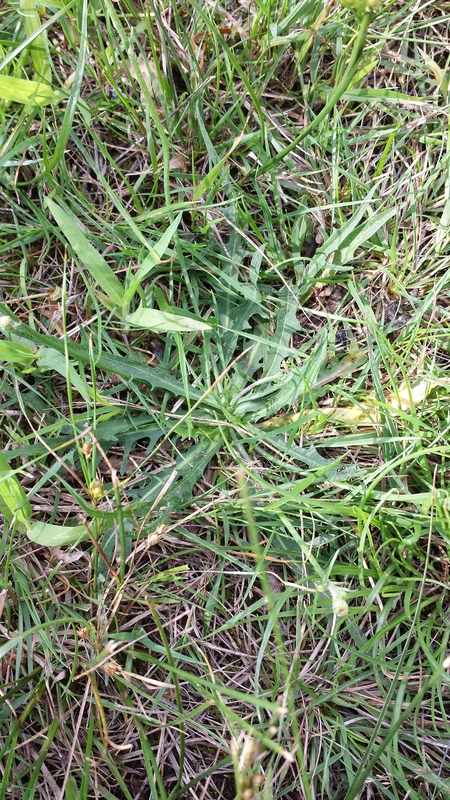 Most hawkweeds have smoother leaves than this one so it’s easier to identify them. This one is a little “toothy.” It’s really the multi-part flowers that give it away, in part–and it doesn’t decay into that puffball of seeds either. And no sap-filled stem–but I didn’t show you that! Who knew weeds could be so much fun?